The Bolt EV rides on a wheelbase 3.9 inches shorter than that of a Toyota Prius, but it’s a massive 14.7 inches shorter bumper to bumper. Despite those packaging constraints, “The space inside is stellar,” said our spiring Christian Seabaugh, who noted the ample legroom and headroom up front and an “enormously comfortable and roomy” rear seat for a vehicle this size. Indeed, our tallest testers had no problem sitting in the rear even with the front seat racked rearward to accommodate a 6-foot-plus driver. The interior is well finished for a car for this class, the dash dominated by a textured white trim element that manages to look different without being contrived. The 8.0-inch digital instrument panel and 10.2-inch touchscreen infotainment interface feature modern graphics in a fresh color palette. The simple HVAC controls are well placed and easy to use. 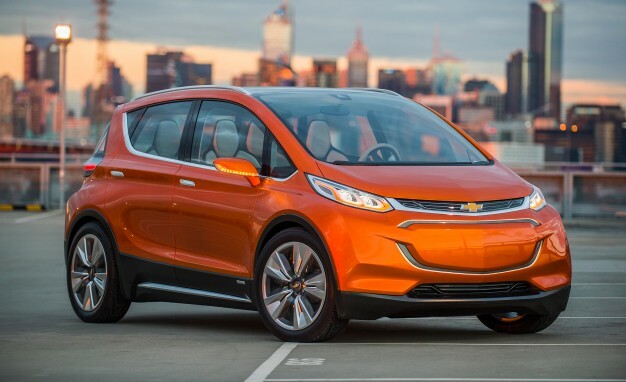 The Bolt EV has been engineered from the wheels up to be an electric vehicle, and the excellence runs deep. The engineering excellence isn’t confined to all the electric powertrain hardware and software, either. The front seats feature an industry-first ultra-slim design that uses a metal framework and a flexible plastic shell lined with a very thin layer of foam. Up to seven devices can connect to the available 4G LTE onboard Wi-Fi hot spot, and up to 10 phones can connect to the car. Drive data can be recorded and shared, so Bolt EV owners can compare miles/kW-hr, energy regeneration, and climate efficiency. In our testing, the Bolt EV easily makes its EPA-certified range of 238 miles in normal driving conditions. Of course, as with a gasoline-powered car, your mileage may vary—flat-foot the Bolt EV everywhere, and you’re not going to travel as far before you need to put more energy in the “tank.” More important, our testing suggests it’s more efficient than the Tesla Model S 60, using about 14 percent fewer kW-hrs of energy to complete our Real MPG test route. The Bolt EV has yet to be independently tested by NHTSA or IIHS, but GM says it has engineered the basic structure of the car to deal with the forces of the new small-overlap crash test despite its small overhangs, using an upper cradle and a cross-car beam to stabilize the front end. Five cross-car beams and a structural steel tray not only add to the overall structural integrity but also protect the battery pack in side impact crashes. On the face of it, $37,495 seems a lot for a compact hatchback, but the math deserves some perspective. The federal EV tax credit of $7,500 gets the price down to less than $30,000, which is outstanding value given current electric vehicle tech. And certain state rebates may knock the price down even further. Only a Tesla can offer superior range and performance, and the cheapest Model S 60 costs $67,200 (before rebates). Sure, that Tesla is quicker and faster, but it only has an EPA-certified range of 210 miles. If you want to do better than the Bolt EV, you’ll need to spend $74,500 (before rebates) for the Model S 75. Of course, the Tesla Model 3 is slated to be priced around the same as the Bolt EV and scheduled to start trickling off assembly lines in late 2017. But Tesla has been evasive about prices for a fully equipped vehicle. The Bolt may still maintain its edge here. American engineering ingenuity and manufacturing capability kick-started automobility in the early 20th century. Now, a little more than a century later, America is about to do it again. The practical, affordable, fun-to-drive Chevrolet Bolt EV has made electric-powered transport for the masses a reality. The 2017 Motor Trend Car of the Year is the car of tomorrow, today.